Despite President George W. Bush's assurances that Islam is a peaceful religion and that all good Muslims hunger for democracy, confusion persists and far too many Westerners remain convinced that Muslims and terrorists are synonymous. In the aftermath of the attacks of 9/11, the subsequent wars in Afghanistan and Iraq, and the recent bombings in London, an unprecedented amount of attention has been directed toward Islam and the Muslim world. Yet, even with this increased scrutiny, most of the public discourse regarding Islam revolves around the actions of extremist factions such as the Wahhabis and al-Qa'ida. But what of the Islam we don't hear about? As the second-largest and fastest-growing religion in the world, Islam is deemed by more than a billion Muslims to be a source of serenity and spiritual peace, and a touchstone for moral and ethical guidance. While extremists have an impact upon the religion that is wildly disproportionate to their numbers, moderates constitute the majority of Muslims worldwide. It is this rift between the quiet voice of the moderates and the deafening statements of the extremists that threatens the future of the faith. In The Great Theft, Khaled Abou El Fadl, one of the world's preeminent Islamic scholars, argues that Islam is currently passing through a transformative period no less dramatic than the movements that swept through Europe during the Reformation. At this critical juncture there are two completely opposed worldviews within Islam competing to define this great world religion. The stakes have never been higher, and the future of the Muslim world hangs in the balance. 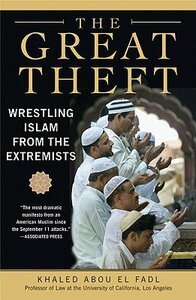 Drawing on the rich tradition of Islamic history and law, The Great Theft is an impassioned defense of Islam against the encroaching power of the extremists. As an accomplished Islamic jurist, Abou El Fadl roots his arguments in long-standing historical legal debates and delineates point by point the beliefs and practices of moderate Muslims, distinguishing these tenets from the corrupting influences of the extremists. From the role of women in Islam to the nature of jihad, from democracy and human rights to terrorism and warfare, Abou El Fadl builds a vital vision for a moderate Islam. At long last, the great majority of Muslims who oppose extremism have a desperately needed voice to help reclaim Islam's great moral tradition.